The Martian directed by Ridley Scott based on a novel by Andy Weir. Considering the last science fiction movie directed by Ridley Scott, I waited for this movie with a bit of anxiety. I still think Scott is a great director, but a butchered plot really can ruin everything. Matt Damon already knows a thing or two about being stranded on a distant planet. But don’t get me wrong, this movie is entirely different. 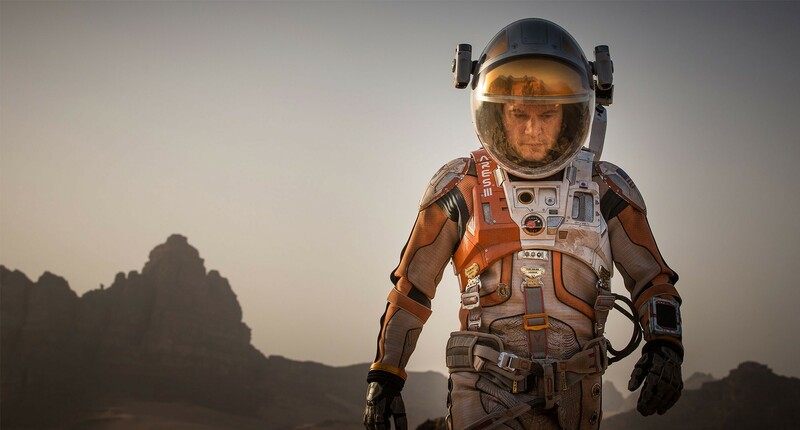 The Martian is fun, optimistic and keeps its feet firmly on the ground, well Martian ground to be more precise. While dancing around a black hole made for Interstellar breathtaking moments, The Martian can be summarized as Man versus Mars. Put in other way while Cooper’s crew carried on their shoulders the last hope of humanity, Mark Watney is by all standard simply that – an ordinary man. By the way there is still something I’ve a hard time to find out about this movie. And I wish I could see it again just for that. From time to time you can see a personage programming to solve some random problem, the camera switches to some computer screen and you can briefly see the source code. I noticed semicolons, and perhaps arrows, but could not pinpoint which language it was. Still it seemed familiar. So if anyone knows better. So my first solution was to limit the stress on the SD-Card. I measured the IO bandwidth of various task with iotop -aoP. Turns out that most tasks accounted for only a handful to a hundred of kylobytes. These tasks are sporadic (dhcpd, rsyslogd and jbd for the most part) and in the end of the day accounted for less than 20MB read/write on the SD-Card. On the other end an update (apt-get) account for around 80MB of writes. That’s a lot combined to increased CPU usage that further contributed to the voltage drop. With apticron running an update at least once a day, it’s not a wonder that the SD-Card got corrupted so quickly. You cannot upgrade after the system just rebooted. You need to rebuild the cache with apt-get update first. But that is not a problem as apticron does so automatically once a day. The number of packages you can install / upgrade at once depends on their size and the size of the tmpfs. But it is OK if you frequently upgrade your system on stable. But that is probably not enough to avoid corruption on the SD-Card. Or at least this is what I thought. So the other solution was to find a way to raise the voltage from 4.66V to a reasonable value. The F3 polyfuse that protects the board has a noticeable resistance causing a voltage drop of ~0.2V. 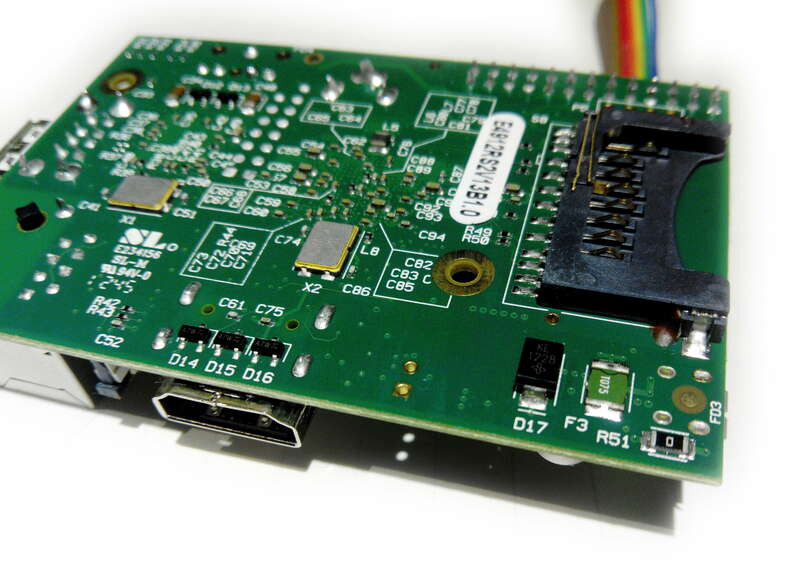 The F3 polyfuse (green) is located at the back bottom right of the board. I soldered the polyfuse and the voltage raised to 4.85V. Did not have any corruption problem since more than a month. Fantastic! However remember that the fuse is there for a reason. It limits the maximum amount of current powering the board. Without the polyfuse the RPi can ask more current than the PSU is rated for (which can happen for example if you short the GPIOs). So it might be a better idea to try another power supply or USB cable. I just like to live dangerously. I also protected those RPi with a case. Note that the RPi B+ and newer have a new power supply circuitry with a lower voltage drop. So all of this may not be needed.